At each trial, the rhinoceros was immobilised with a combination of 2 mg - 3 mg etorphine hydrochloride (dose range 2.0 µg/kg - 2.6 µg/kg) (M99®, Novartis, Kempton Park, South Africa, 9.8 mg/mL), 30 mg - 45 mg azaperone (dose range 30 µg/kg - 40 µg/kg) (Stressnil®, Janssen Pharmaceutical Ltd., Halfway House, South Africa, 40 mg/mL) and 2500 international units (i.u). hyaluronidase (lyophilised hyalase, Kyron Laboratories, Benrose, South Africa). The dosage of the drug was calculated from the previously measured body mass according to a standardised dose table (Haw et al. 2014). Immobilising drugs were administered into the nuchal hump using a 3 mL plastic dart with a 60 mm needle, powered by a CO2-powered dart-gun (Dan-Inject, South Africa) as described previously (Haw et al. 2014). Once the rhinoceros was immobilised, it was blindfolded and positioned in lateral recumbency (Time 0). 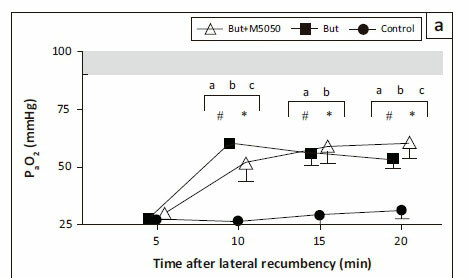 Trials were performed only if the animal became recumbent within 15 min of darting, and position was altered between left and right lateral recumbency at each immobilisation. We used GraphPad Prism version 6.00 for Mac OS X (GraphPad Software Inc., San Diego, California, US) for statistical analyses. All results are reported as mean ± SD, and p < 0.05 was considered statistically significant. For the boma study, we used a repeated measures two-way analysis of variance (ANOVA) followed by Tukey's multiple comparisons for two separate analyses. 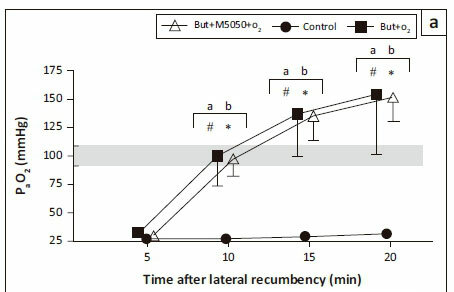 In the first analysis, we looked for differences between responses to But, But+M5050 and sterile water (control) at 5, 10, 15 and 20 min (trials without oxygen), while in the second analysis we looked for differences between responses to But+O2, But+M5050+O2 and sterile water (control) at 5, 10, 15 and 20 min (trials with oxygen). For the field study, we used a two-way ANOVA followed by Sidak's multiple comparisons test to test for differences between responses to But+O2 and But+M5050+O2 at 5, 10, 15, 20 and 25 min. A Tukey's post-hoc test was used to test for differences in values between time points within each trial. All boma-housed rhinoceroses were in good health, indicated by normal demeanour and normal eating and defaecation habits throughout the study period. Field rhinoceroses were also in good health at the time of darting, determined by observing normal behaviour from the helicopter before darting and evaluating body condition score. Each animal's health status was confirmed by subsequent haematology and biochemistry analysis of blood samples collected at the time of each immobilisation. Rectal temperatures for boma-immobilised rhinoceroses ranged from 36.7 °C to 39.0 °C and 37.6 °C to 38.5 °C for field-immobilised rhinoceroses. The average body mass of the boma rhinoceroses was 1220 kg ± 148 kg. In the field study, the average body mass for the But+O2 group (n = 14) was 1272 kg ± 227 kg, while that for the But+M5050+O2 group (n = 8) was 1336 kg ± 339 kg. Most field rhinoceroses were estimated to be in the correct body mass bracket according to the dose table (Haw et al. 2014), although four rhinoceroses in the But+M5050+O2 group were estimated to be in one bracket lower than their actual mass. Despite the lower than recommended dose of etorphine, these rhinoceroses were immobile within 15 min of darting. Etorphine doses ranged from 2.0 mg to 3.5 mg and azaperone 30.0 mg to 52.5 mg. Hyaluronidase was kept constant at 2500 i.u. for each rhinoceros. The level of immobilisation did not change between the trials as the median immobilisation score at all time points across all trials was 4 (recumbent with ear movements). No acute mortality occurred in the rhinoceroses that were studied. All rhinoceroses had similarly elevated PaCO2 values at 5 min of 82 mmHg ± 6 mmHg (control), 83 mmHg ± 9 mmHg (But), 81 mmHg ± 7 mmHg (But+M5050), 79 mmHg ± 7 mmHg (But+O2) and 72 mmHg ± 5 mmHg (But+M5050+O2) (Figure 1b and Figure 2b). PaCO2 then changed over time in the trials without oxygen (F(3,21) = 20.8, p < 0.0001) and those with oxygen (F(3,21) = 4.61, p = 0.01). PaCO2 in the rhinoceroses also changed amongst treatment groups in the two sets of trials (F(2,14) = 34.16, p < 0.0001 [trials without oxygen]) and (F(2,14) = 8.78, p = 0.003 [trials with oxygen]). 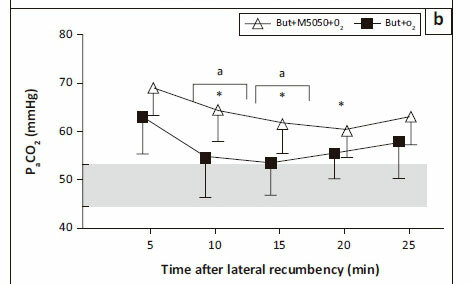 The treatment interventions led to lower PaCO2 values in the rhinoceroses compared to when no treatment was administered (control) at all time points following the interventions, and by the end of the immobilisation period, PaCO2 values in the rhinoceroses that received treatments were lower compared to those at 5 min (p < 0.05). At 20 min, the rhinoceroses had PaCO2 values of 82 mmHg ± 4 mmHg (control), 68 mmHg ± 3 mmHg (But), 64 mmHg ± 7 mmHg (But+M5050), 72 mmHg ± 13 mmHg (But+O2) and 72 mmHg ± 5 mmHg (But+M5050+O2). 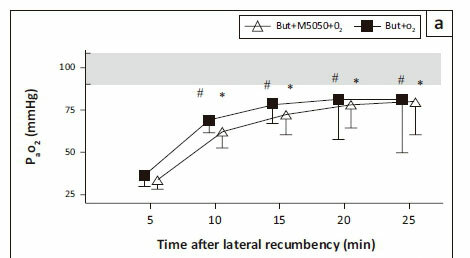 Throughout the immobilisation period, there were no differences in the rhinoceroses' PaCO2 values between the But and But+M5050 trials (apart from 10 min, p < 0.05), nor the But+O2 and But+M5050+O2 trials (p > 0.05). 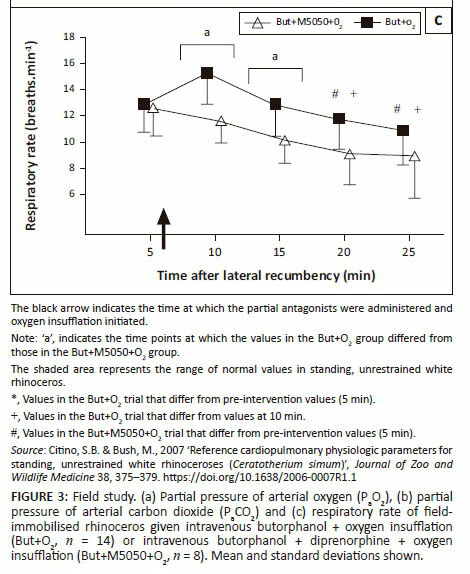 At 5 min, the respiratory rates in the rhinoceroses were similar across trials (p > 0.05) with values of 7 ± 2 breaths/min (control), 6 ± 1 breaths/min (But), 7 ± 1 breaths/min (But+M5050), 7 ± 1 breaths/min (But+O2) and 7 ± 2 breaths/min (But+M5050+O2) (Figure 1c and Figure 2c)., which is much lower than the reported normal respiratory rates in standing, unsedated white rhinoceroses (16-23 breaths/min [Citino & Bush 2007]). The rhinoceroses' respiratory rates then changed over time in both sets of trials (F(3,21) = 14.76, p < 0.0001 [trials without oxygen] and F(3,21) = 9.85, p = 0.0003 [trials with oxygen]). However, the different treatment interventions did not lead to differences in respiratory rates in the rhinoceroses (F(2,14) = 3.4, p = 0.06 [trials without oxygen] and F(2,14) = 0.1449, p = 0.87 [trials with oxygen]), except at 10 min, where the post-hoc test indicates that But+O2 led to improved respiratory rates compared to But+M5050+O2 (p < 0.05). 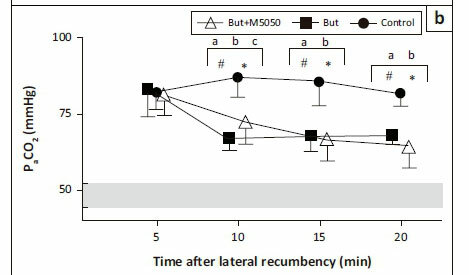 At 20 min, the rhinoceroses had respiratory rates that were similar to those at 5 min across all trials, namely 6 ± 2 breaths/min (control), 7 ± 1 breaths/min (But), 7 ± 2 breaths/min (But+M5050), 6 ± 1 breaths/min (But+O2) and 6 ± 1 breaths/min (But+M5050+O2). 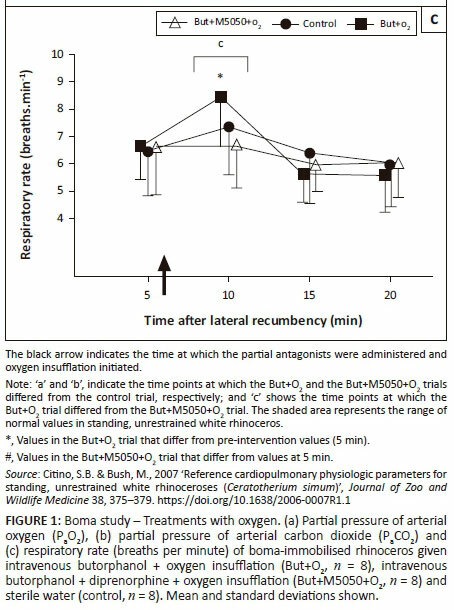 Previous work has demonstrated that butorphanol with oxygen insufflation corrects the etorphine-induced hypoxaemia in boma-immobilised white rhinoceroses (Haw et al. 2014) and significantly reduces the severity of the hypoxaemia in field-immobilised white rhinoceroses to a clinically acceptable level (Haw et al. 2015). Here, we show that the same positive effect on blood gases can be achieved if butorphanol is replaced with a lower dose of butorphanol combined with diprenorphine. Similar to findings in our previous study (Haw et al. 2014), these opioid agonist-antagonists, at the doses used, only moderately improved blood oxygenation; thus, the addition of oxygen insufflation is necessary to correct the opioid-induced hypoxaemia. 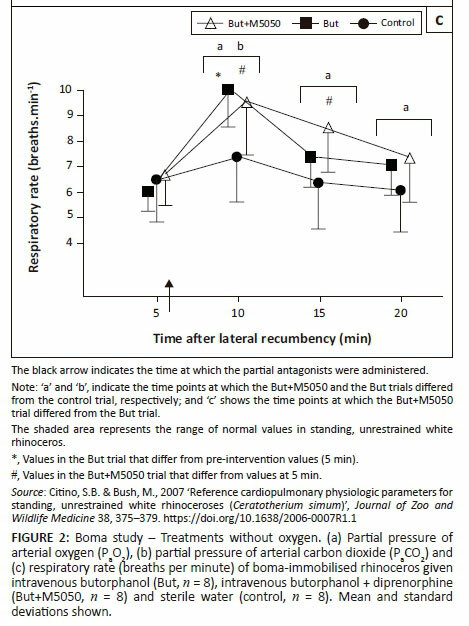 In the boma study described here, the partial pressure of arterial oxygenation was completely corrected with both treatments that included oxygen (But+O2 and But+M5050+O2), with no differences between the use of a single or combination of partial agonist-antagonist treatments. Although the interventions without oxygen (But and But+M5050) improved but did not correct the etorphine-induced hypoxaemia, the responses to the treatments were clinically similar in the boma trials. 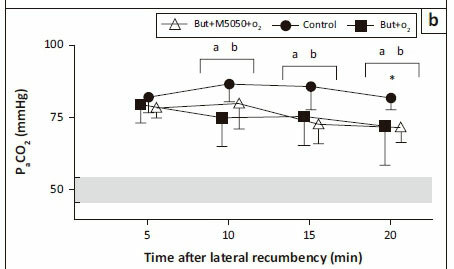 Similarly, in field-immobilised rhinoceroses, there were no differences in the rhinoceroses' PaO2 values between the two treatments (But+O2 and But+M5050+O2), but the blood oxygenation was not completely corrected despite the animals receiving oxygen insufflation, although it was significantly improved, leading to a clear clinical benefit from the treatments. Both butorphanol and diprenorphine are opioid agonist-antagonists. However, diprenorphine is known to have greater antagonistic effects than butorphanol (Burroughs, Meltzer & Morkel 2012b). Indeed, diprenorphine (M5050®) is supplied with etorphine (M99®) by its current manufacturer, Voluplex, and is registered as the standard antidote for etorphine-induced immobilisation. To reverse the effects of etorphine, diprenorphine is given at 2-3 mg per mg etorphine (Burroughs et al. 2012b; Swan 1993). In most species, diprenorphine has been the most commonly used antagonist (Burroughs et al. 2012b) and recovery times following intravenous diprenorphine administration range from a few seconds to 4 min (Swan 1993). However, it is believed that diprenorphine does have some agonistic effects, and a degree of sedation may be maintained when it is used, particularly in some species (white rhinoceros, elephant and giraffe). Therefore, it is recommended that a pure opioid antagonist, such as naltrexone, be used to reverse the effects of opioid agonists in animals that are to be released into the wild (Burroughs et al. 2012b). In white rhinoceros, diprenorphine appears to not antagonise the effects of etorphine completely and animals will remain partially narcotised for up to 8 h following the administration of diprenorphine (Kock et al. 1995; Rogers 1993). Whether these effects can be attributed to possible agonistic effects of diprenorphine, as has been found at kappa-receptors in the guinea-pig ileum (Traynor, Corbett & Kosterlitz 1987), or simply poor efficacy or lower affinity of this drug to opioid receptors in this species remains to be determined. Based on anecdotal findings from the field, practitioners have suggested giving 1 mg diprenorphine with 10 mg butorphanol IV immediately to all white rhinoceroses (Burroughs et al. 2012a). To standardise our trial, diprenorphine and butorphanol were administered at a set ratio to the dose of etorphine used in the immobilising dart. Therefore, 0.4 mg diprenorphine and 3.3 mg butorphanol per mg etorphine were used, which equates to about 1 mg diprenorphine with 10 mg butorphanol for 2 mg - 3 mg etorphine administered. The results of this study have demonstrated that the treatments But+O2 and But+M5050+O2 both elicited similar changes in respiratory responses and corrected the etorphine-induced hypoxaemia in boma-immobilised white rhinoceros. However, treatment with butorphanol+diprenorphine, at the doses used in these trials, was not as beneficial as butorphanol at the higher dosage used alone in correcting the etorphine-induced hypercapnia and hypopnoea. Our evidence shows that at certain times the rhinoceroses had higher PaCO2 values and lower respiratory rates after But+M5050+O2, compared to those after But+O2. Thus, although both treatments had the same effect on the rhinoceroses' PaO2, the treatment with diprenorphine did not always improve PaCO2 as well as the treatment without diprenorphine, where a greater dose of butorphanol was used. This discrepancy in the treatments' effects on PaCO2 may partly be explained by uncontrolled confounders. One possible limitation of the study is that the But+M5050+O2 group had a smaller sample size than that of the But+O2 group. Another possible explanation could be that when butorphanol+diprenorphine is used in the field, compared to butorphanol alone, the lower dose of butorphanol or the differing antagonist effects of diprenorphine in this combination may have a better effect on antagonising other pathophysiological effects of etorphine that cause hypoxaemia (Buss et al. 2018; Meyer et al. 2015), with less of an effect on ventilation or the production of carbon dioxide from metabolism. The South African National Research Foundation, the South African Medical Research Council, the International Rhino Foundation, Disney's Animal Programs and Environmental Initiatives, SANParks and the University of the Witwatersrand and the University of Pretoria provided equipment, drugs and financial support for the research. The South African Veterinary Association paid for the article page fees.